With eight teams registered for the Valencia Match Cup and a fully stacked 10 entry lineup for Malvarrosa Match Cup, both WMRT regulars mixed in with new special guests, the Valencia WMRT double-header was set to provide an action filled start to the 2018 match racing season. Valencia Match Cup, running 20-22nd February, began in style with 15-20 knot breeze in a good swell, catching some of the less experienced teams out by testing boat handling skills in these tough conditions, up against strong competition. 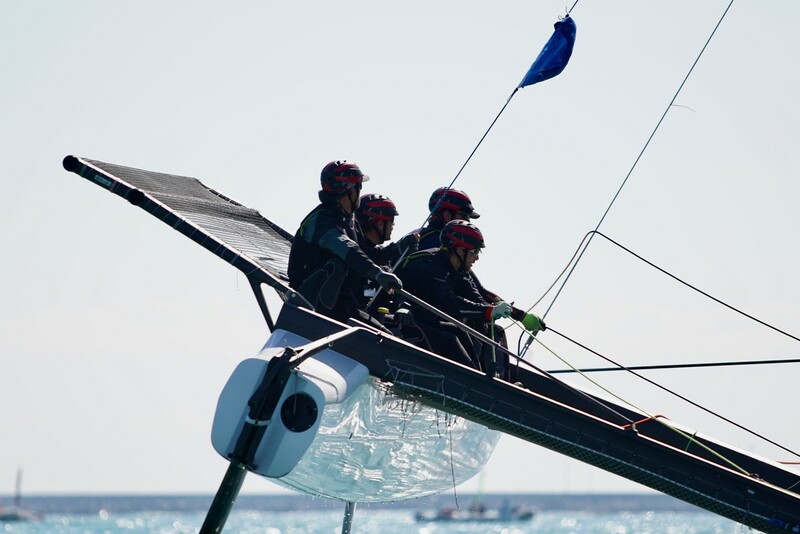 The hugely experienced catamaran racer, Arnaud Psarofaghis with his team Alinghi, progressed through he Round Robin Qualifying stage and into the Semi Final stage at their first M32 era WMRT event. As early leaders, winning the Round Robin series unbeaten, the team picked Daniel Bjørnholt's Youth Vikings Denmark to face in the Semis. Although finishing lower down the leaderboard after the initial stages, Bjørnholt proved himself at the WMRT Miami qualifiers last spring and this experience helped him to get past Psarofaghis in an enthralling 3-2 victory over the Swiss which secured himself a place in the final and the all important qualification spot to a Championship level event. Up next was the three day Malvarrosa Match Cup - take two for some teams who used the first three days as a warm up. Polish Team Delphia Sailing Team left the group and made way for 3 new entries - Denmark's Jonas Warrer, Sweden's Johnie Berntsson and The Netherland's Pieter-Jan Postma. A four-way tie on six points for the three spots remaining in the Semi Final stage was settled by the umpires in the final race of the Round Robin as Psarofaghis was docked 0.5 penalty points for his collision running into the stern of USA's Markus Edegran. Berntsson, surprisingly, chose the more experienced Jonas Warrer to face in the Semi Finals. After winning the first match, Berntsson's choice looked to be a good one, however the dreaded Danes were back and went on to win the subsequent three matches to take them to the final, and secure the all important place in the Championship level season.